A huge crowd gathered in London, UK on Friday for a mass "moonwalk"
LONDON, England -- A huge crowd gathered in London, UK on Friday for a mass "moonwalk" -- paying tribute to Michael Jackson by dancing to his most iconic songs and replicating his famous walk. 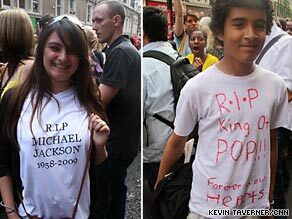 Two young fans who say Michael Jackson meant a lot to them donned self-made T-shirts at the event in London. The horde of people gathered on the streets outside Liverpool Street train station, one of the city's major transport hubs, and burst out into cheers, chants and dances to the tunes of "Billie Jean," "Bad" and "Thriller." Life-long Jackson fan Milo Yiannopoulos organized the moonwalk, the singer's trademark backwards shuffle, by sending messages via Twitter and Facebook. "I don't know what I've unleashed here," Yiannopoulos, who said he doesn't even know how to moonwalk, told CNN. He came up with the ideas "because of all of the stuff people are saying about Michael Jackson -- surgeries, molestation etc. -- I wanted to do something to remind people how great he really is and remind them of his music." But those who were there did not seem to need much reminding of Jackson's greatness. "He is the biggest idol in my life. Unfortunately, I did not grow up with all his best hits, but he has been so important for me. I am very sad," said 13-year-old Paul Graham, who wore a self-made Michael Jackson "Rest in Peace" T-shirt. Another of the many young fans there was 17-year-old George Webster, who spontaneously performed a perfect Michael Jackson dance routine for a cheering audience. He told CNN: "This is a celebration. We are here to remember Michael Jackson's best moments." British television presenter Gail Porter was also at the tribute: "As soon as I saw it on Twitter, I thought 'let's go and have a dance'," she told CNN while twittering away on her cell phone. The gathering started off to a rocky start, as the short notice had left London city police unsure about how to handle it and what to expect. They were overheard telling organizer Yiannopoulos that they would not allow him to do the moonwalk outside the station and that he had to limit his gathering to 300 people. Eventually the crowd was allowed to gather outside, attracting many more tourists, commuters and passers-by to join in the event. "I want to thank the police for being so cool," Yiannopoulos told the audience. "You guys are great, let's continue dancing." More tributes are now expected to take place around the world and Austria has already replicated London's moonwalk event with their own on Friday.